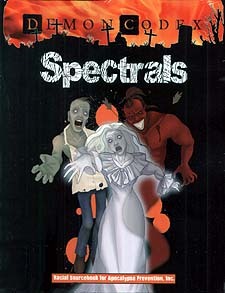 Spectrals are fueled by their passions and their desperate connection to the world of the living. They ignored the calling of the Bright Lights for one reason or another, only to continue on as ephemeral beings. Some find only despair in their choice, while others hope their final destiny still awaits. Could the dead truly hold the key to life itself? Demon Codex: Spectrals is the second racial sourcebook for Apocalypse Prevention, Inc. and serves as a complete guide to adding ghosts and spirits to your game as characters or antagonists. Details on their dead gatherings and horrible threats await within, along with several new Evolved Spirit types that go beyond what science has deemed possible.